Fuelcell Towing Tractor is a concept model that shows the future of towing tractors that are becoming increasingly vital at airports, especially in the face of advancing internationalisation and increasing air cargo volumes. Hydrogen fuel is used to generate the electricity required to drive the vehicle with motors. Only water is emitted, making this an incredibly environmentally-friendly truck. Filling time is minimal, facilitating efficient operation. 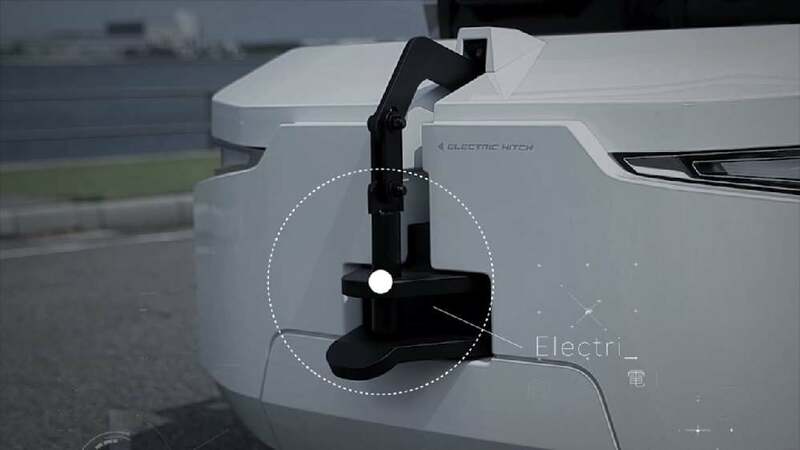 Harnessing the features of fuel cells not only benefits the environment but also leads to a more streamlined process by enabling long periods of operation with minimal filling time. Furthermore, the use of information technology allows appropriate information to be displayed. This facilitates automation, which in turn reduces the operator load, resulting in further streamlining. The result is a reduction in operator load and improved efficiency and safety, helping paint a brighter future for the logistics business. An advanced fuel cell unit is enclosed in a thick plate capable of withstanding heavy-duty operating environments, and its design helps the operator anticipate vehicle movements.This simple design that takes operator workability into consideration has been applied to the vehicle interior.